Damus-Kaye-Stansel Procedure How Is It Treated? Excessive pulmonary blood flow in double inlet left ventricle may be corrected by the insertion of a band around the trunk of the pulmonary artery (shown in yellow on the diagram at right). 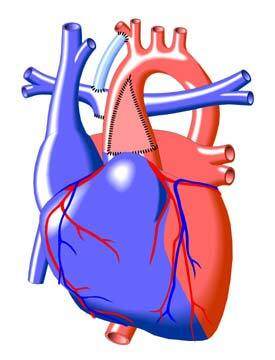 This narrows the pulmonary artery, which reduces blood flow. There may be complications after the Pulmonary Band Procedure, resulting in obstructions to the flow of blood through the aorta to the body. This situation may be treated by surgery. For example, the Damus-Kaye-Stansel Procedure, followed by the Glenn procedure and the Fontan procedure as the final stage of single ventricle palliation. The image to the left illustrates one surgical option - the Damus-Kaye-Stansel Procedure, in which the aorta and pulmonary artery are joined using a patch (pink). The blue tube (made of Gore-Tex®) is known as a Modified Blalock-Taussig Shunt. Other surgical options include the Fontan Procedure (see under Tricuspid Atresia) and the Norwood Procedure (see under Hypoplastic Left Heart Syndrome), which separate the pulmonary circulation (to the lungs) from the systemic circulation (to the body).